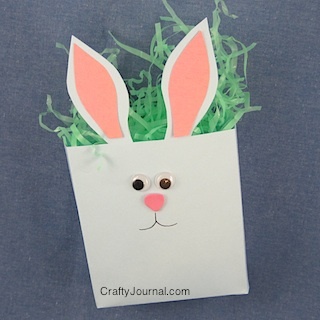 Make a fun bunny bagalope with an envelope. It’s easy and quick to do and could be used as a gift bag, for favors, or even a small Easter basket. You can make different sizes depending on the size of the envelope you use. How to Make a Bunny Bagalope. 1. Seal the envelope completely. Use glue or double sided tape to seal the entire edge. 2. Turn the envelope so the sides are at top and bottom, and the sealed flaps are at the back. 3. Score 3/4 of an inch in from the edge on 3 sides: the sides and bottom of the envelope. Fold forward on each score line and crease sharply. Fold backwards on each score line and crease sharply. 4. At the bottom corners score a diagonal line as shown. Crease this score sharply both forwards and backwards. 5. Measure up 5 1/4 inches from the bottom and draw a light line across at this point. Draw a pair of ears upward from this line. 6. Cut out around the ears, leaving them attached to the envelope at the base of the ears. If you are making several bunny bagalopes of the same size, save the cut-out piece from the top and use it as your template for the rest of the bags. Quick and easy! 7. Cut off the back set of ears. 8. Make a smaller set of ears in pink to put inside the larger ears. Attach with glue or double sided tape. 9. Attach the eyes and nose. 10. Open the folds of the bagalope out. At the bottom, glue or tape the 2 triangles to the bottom of the bag. And don’t forget to add a cotton ball for the tail. Add Easter grass with candy or a gift to the bunny bagalope. For the eyes you could use a punched black circle, or you could just draw the whole face on. If kids are making the bagalopes, it would be cuter to have them draw their own faces. You could also color inside the ears rather than make a separate piece. If you don’t have access to envelopes, you could use this idea on brown or white lunch sacks. This is adorable! Also going on my to do list…probably for school favors. You are so creative! Thanks for sharing at A New Creation party! This is cute and I could adapt my own bag craft to make something similar. Will pin. Thanks for sharing. Very cute! This would be perfect for my preschooler’s Easter party. Thanks for sharing. Really great idea. I’d really love for you to consider linking up to our Pattern Party. So cute . . . thanks for sharing! such a cute project, thanks for sharing. How cute!! Thanks for sharing at my Twirl & Take a Bow Party! Have a great week. Adorable! I found you from Hope Studios Tutorial Tuesday. Thanks for sharing! This would be perfect for our family Easter Egg Hunt! Thanks – This bunny envelope is adorable and looks like something I could do with my kids. Found your bunny from fireflys and jellybeans. I pined it cuz it was so cute and im going to make this definatly. Thank you for the tutorial. Check out my E.a.s.t.e.r crafts. Noreen, your Bagalopes are adorable! We’re “springing forward” this weekend at Friendship Friday – would love for you to share them with us! Adorable! Thanks for visiting and linking to One Creative Weekend at OneCreativeMommy.com! Cute and simple. I love it. So do-able. You’re an inspiration, you know that!? We love to connect with our featured bloggers, so if you would like to follow us or like us on any of those outlets, just leave a message and we will be sure to follow back. Adorable! Thanks for sharing at Pinworthy Projects. Noreen these are super cute. Thanks for sharing the tutorial. What a great project. This looks like so much fun, I think I will help my girls make some. Great instructions too. Thanks for joining us at Craftin Desert Divas Linky Party. Thanks so much for linking up to my Show Off Your Shell Party! I’ll be featuring your Easter activities this week!! Fun idea! Thank you for linking up at Fluster’s Creative Muster. What a cute idea! Thank you for sharing it! How cute! I would love to use this as an alternative to an Easter basket. You’re all set for Easter! Cute! Thanks for linking up to The Best Blog Recipe’s Weekend re-Treat #7! Oh wow, these are fun!!!! We love your projects! Thank you so much for linking up in our Crafty Showcase! You are always so inspiring! Adorable bunnies!!! Thank you for sharing them. Very Cute! Thank you for sharing at my Easter Party at My Life’s a Treasure. What a cute and simple idea – thank you for sharing.